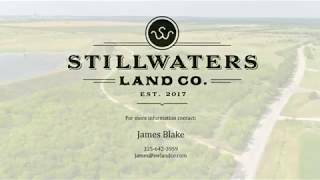 Fin and Feather Ranch - James Blake - Stillwaters Land Co. PRICED BELOW COMAL COUNTY APPRAISED VALUE AT $7,900 ACRE! Description: Fin and Feather Ranch is one of the finest fisheries and wing shooting properties in Comal County! Highlighted by an approximately 20 acre York Creek Improvement Conservation Lake (Soil Conservation Service Site 3 Reservoir). This lake has produced many black bass over 8lbs. The wing shooting for dove and duck is phenomenal as surrounding agricultural planting provide ample food and flyways. When the weather turns cold the ducks pour into the lake and produce excellent shooting opportunities. A fishery and wing shooting opportunity in Comal County of this quality is a rare find! York Creek Improvement District will be allowed access to the property to perform routine checks to ensure structural integrity of the dam is intact. The land maintains agricultural exemptions through 80 acres of native grass for grazing with sectioned traps being fenced off. Utilities: Water is provided to Fin and Feather Ranch through Crystal Clear SUD based in San Marcos, TX. Electricity is provided through Pedernales Electric Cooperative (PEC). Access: Fin and Feather Ranch is accessed directly from Soechting Lane. Paved to the gate entrance. Improvements: Fin and Feather Ranch has a 3-Bay metal building/shop supplied with water and electricity perfect for storage and maintenance. Two bays have roll-up doors and one bay is open for parking. Price: $829,500/or $7,900/acre. 2017 ag-exempt taxes were $265. The information contained herein is deemed reliable, but is not warranted by Broker or Seller, and is subject to change, prior to sale, errors and/or omissions and withdrawal from market. Buyer(s) are responsible for their resolution to purchase subject property according to local, state, and federal law, and due diligence as required by proposed use.